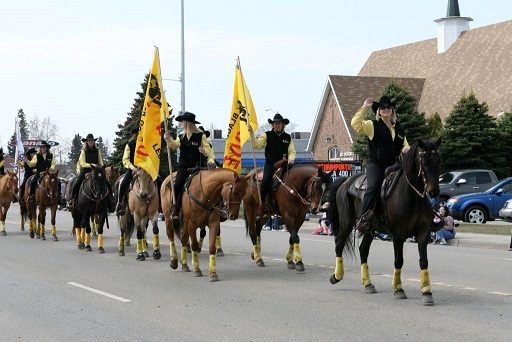 One of the most popular features of both the annual Leduc Black Gold Professional Rodeo, as well as the beloved Rodeo Parade, is the Leduc Black Gold Riders. This expert equestrian group display amazing horse ridership that thrills every crowd they’ve performed for over the past 14 years. 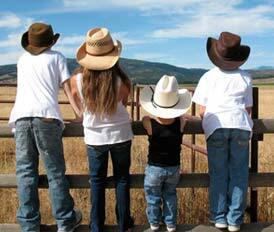 Now this talented group is branching out by becoming the very first Canadian drill team to perform at the world famous Reno Rodeo in Nevada. According to the group’s founder, Kathleen Hutchison-Rock, it has been a labour of love to get an experienced drill team who can compete with some of the most accomplished riders on the continent. She recognizes deeply that the dream would never have come to fruition without the great sponsors they got for their trip, including the Black Gold Rodeo Association. Hutchison-Rock started the group in 2000, at the behest of her husband, Black Gold Rodeo president, Dave Rock. He wanted to have female trick riders carry the sponsor flags for the rodeo contestants as they do at other stampede-like events. Of course, merely carrying flags would be far too simple, so the lady Riders ramp up the degree of difficulty many-fold. They race around the arena at lightening speed while executing breathtaking cuts and turns to the delight of the rodeo attendees. It is like hyper-velocity synchronized swimming, only on horseback. Obviously, a lot of practise is essential for the sport as teamwork is a vital element. “When we ride together we learn to trust each other, which is important as the horses are going fast and the riders must have the ability to make split second decisions,” said Hutchison-Rock. The riders come from all over the central Alberta area with representation from Leduc, Edmonton, Red Deer, Thorsby and Wetaskiwin. Trust is an oft-repeated mantra with the group as they must feel comfortable with one another; knowing where the other riders will be and what they will be doing,. during every second of their performance. Even with practise, however, as with every live event, sometimes things do go a bit sideways. Over her fourteen years, Kathleen has seen it all. The Leduc Black Gold Riders have been all over Alberta, including events as far away as Harmon Valley Rodeo in the Peace Country as well as the Doggy Doo Charity Rodeo, which is an adjunct to the Calgary Stampede. The trip south of the border for the Reno Rodeo will be a huge thrill for the group, says Hutchison-Rock and the club is most appreciative of the encouragement they have received for their initiative so far.